I felt very comfortable with Dr. Nolan. She answered all my concerns and filled me in with any important information regardingmy personal situation. Her staff was also very friendly and made me feel comfortable as well. I hope to keep her as my doctor. I felt very comfortable with Dr. Nolan. She answered all my concerns and filled me in with any important information regarding my personal situation. Her staff was also very friendlyand made me feel comfortable as well. I hope to keep her as my doctor. 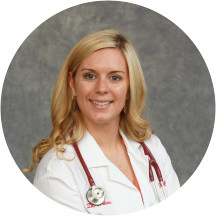 Dr. Nolan was born and raised in Philadelphia, PA. She earned her medical degree in 2009 from the Philadelphia College of Osteopathic Medicine and completed her residency in Obstetrics and Gynecology at York Hospital in 2013. Dr. Nolan practiced in New Jersey in a private practice setting prior to her move to Texas. She is a member of the American Medical Association, American Osteopathic Association, the American College of Obstetrics and Gynecology, and the Texas Medical Association. When she isn’t caring for patients, she enjoys working out, traveling and spending time with her fiancé. She was very good at explaining everything to me. I didn't have many questions but, she gave me as much information as possible and I loved that! Dr. Nolan is absolutely fabulous! She is extremely knowledgeable and shares her love of medicine in a very thorough manner. Horrible Doctor Horrible Staff! Acted like they didn’t know I was pregnant. Asked me if my pregnancy was planned, Where is the father, Why I’m married and it’s not the father. Seems like some weird color preferences going on with thisterrible doctor. Btw I was never given the results of my lab testing. Just like the other negative comments, she looked like she was in a rush. She spent maybe a total of 5 minutes with me. She did not give me a heads up that she was going to start my pap smear,I was in the middle of answering one of her blunt "small talk" questions when she just went in without warning. She was not gentle, she made me feel very uncomfortable. I'm in my mid 20s and have had a good amount of pap smears done before to know that what she did was not normal and painful. She went on to discredit my primary physicians choice of antibiotics to treat my previous uti, even though I told her that I had became resistant to other antibiotics. She didn't even give me a chance to ask questions or asked if I had any concerns, she just stormed out. Very odd experience, I don't know if she just has off days and acts like this because she has a large amount of good reviews but I will not take a chance in going back. Amazing! I’m 32 years old and needed to find a good doctor that would listen to all my random questions and talk me through each while being patient and authentic. Dr. Nolan is that doctor hands down! Book her if lookingfor a doctor that genuinely cares and that you don’t have to wait 2 hours to see. 5 stars! I’m so use to having to wait for at least an hour just to be called back to get my vitals done...not here! I was called back not long after I filled out my paperwork for my vitals and then wasput in a room right away! Very professional and she went over all of my concerns and things I didn’t know I should be concerned about. I highly recommend this office!! The nurse was very friendly and Dr Jamie Nolan was quick and very informational. Easiest exam I have had done so far. I will definitely reschedule my next annual with her. I was very comfortable with Dr. Jamie and she answered all of my questions. Her office was very organized and the wait time was short as things ran very smoothly. I will continue to work with Dr. Jamie for future appt. Dr. NOLAN is the best doctor, love her to pieces. Great visit! Perfect bedside manner highly recommend Dr. Nolan. I HIGHLY recommend Dr. Nolan. Especially for any Trans patients looking for a friendly and safe place. Everyone made me feel EXTREMELY comfortable and I cannot say enough nice things about my experiences, as I have now met with her twice and trust her to do an upcoming surgery. Great Dr. She is very thorough and takes the time to answer any of your questions. I have been going to her for three years now and I highly recommend her. The staff is also great and very helpful. I don't ever recall having a long wait time. Dr. Nolan is awesome. She's professional and personable. I'm so glad I have found a Dr. that makes me feel comfortable. I highly recommend her! I've always been in and out of the office within an hour. Thank you for being authentic and respectful of my wants. LOVE Dr. Nolan, always have great visits! Dr. Nolan is extremely nice and professional as well as the the entire staff at this office. More was accomplished in this 1 visit with Dr. Nolan than with my 2 previous ob/gyn over 2yrs!! I was asked questions, my concerns were answered, then immediate action taken. I love Dr. Nolan! She genuinely cares for all of her patients. She listens and has a great memory.It always seems like I'm in and out, hardly no wait time. I have recommended her to all of my friends and will continue to do so. She immediately addressed any concerns or questions before explaining what needed to happen next. She is not pushy and treats me like an individual rather than a number in her schedule that day. Professional, friendly, practical, and incredibly intelligent. The appointment was quick and Dr Nolan was great. She answered my questions , reassures me and never makes me feel like I have a dumb or silly question. Dr. Nolan is wonderful! She made the visit very comfortable and explained everything as it was happening. I'm so happy to have finally found a great doctor! i was seen 30 min to an hour.she was nice and it was very comfortable with her. She is extremely kind, professional, and very knowledgeable. She pretty much answered every single question before I asked. As long as my insurance allows it I'm sticking with this Dr.. I've dealt with doctors in the past that had horrible bedsidemanner. By far Dr. Nolan has been one of the best and I've only met with her once. Her first impression was amazing, strongly recommend! Dr. Nolan is the best! She really cares about her patients highly recommend her! She was great! Super easy to talk to and very informative. Dr Jamie Nolan was very professional but what I really like about her is her attitude and truly caring ways.. She makes you feel very comfortable like you are talking to a long time friend.. I Absolutely Recommend her for your care. She's the best!! ?? I LOVE DR. NOLAN!!!!!!!!!!!! She has saved my life plenty of times. Best doctor ever! Thank you Dr. Nolan for what you do for me, and all of your patients. YOU are very much appreciated!!!!! She's very fast knowledgeable and thorough,answered all my questions. It was quick, but she thoroughly went over everything being done. She was very polite and answered any questions I had. Dr. Nolan & her staff are always so nice and helpful. They kept me updated on things & I'll definitely keep going back. I went in to confirm my pregnancy. Dr Nolan was very nice and informative. She answered all my questions before I even had to ask. I felt very comfortable with her and I am looking forward to continuing this journey with her. Dr.Nolan was very friendly and very informative about the birth control implant that I had some questions about. She maintained a professional attitude while also being very fun during my visit. She was very talkative and made me feel very welcome. Dr. Nolan was awesome. She is very compassionate and personable. I would highly recommend her! Best Dr ever, adore her n all she's done for me. Dr. Nolan is wonderful, Easy to talk to about any health concerns. She takes time to listen to patients and provides any advise she sees fit for the patient. Highly recommend her and staff was pleasant. Did not have towait at all in waiting area. Thank you, its nice to know customer service as such still exist. Quick, cold and unconcerned. She did not make me feel at ease in anyway. It was my first time going and it was a better expierence than I thought it would be. Dr. Nolan made me feel 100% comfortable and she was super nice. I definitely recommend her!! Genuine care, no beating around the bush, explained everything. I highly recommend Dr. Nolan.